OptiMate 3+ is the most advanced fully automatic diagnostic battery optimizer and maintainer for all 12V lead-acid batteries.This includes sealed & conventional batteries for motorcycle and similar vehicles, including dry-charged "MF" & sealed "WET" maintenancefree types, & sealed "deep-cycle" GEL batteries used in back-up power and other applications involving a steady delivery of power. Best for batteries from 2.5Ah to 32 Ampere-hours capacity. All major starter battery manufacturers recommend maintaining starter batteries FULLY CHARGED during periods of non-use. OptiMate 3+ is totally safe for months-long connection during all-season battery maintenance. No danger of over- charge. Electronically protected against user errors. Just hook up the OptiMate 3+ 10 your battery, the rest is automatic - no switches, no fuses (except battery protection fuse), sparks are suppressed. 1. Initialization: If, when connected, the battery voltage is above 2V, the program goes to step 2; if not, the charger won't start as the battery is not considered recoverable. 2. 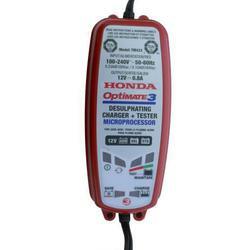 Tests the battery for possible deep discharge or sulfation. If necessary, the Optimate 3+ automatically engages a special high voltage recovery mode (max. 22V) with controlled very low fi xed current, so as to desulfate very fl at batteries, for up to 2 hours, controlled by an internal timer. 3. Charges at 0.6 Amps constant current ('bulk charging' stage) until the monitoring circuit indicates the battery should be able to crank the engine. 4. During a 30 minute timed verifi cation stage the Optimate 3+ ensures that even well-used batteries are brought to lull charge saturation. If necessary the program reverts automatically to the bulk charging stage, as many times as necessary to ensure the battery is thoroughly charged. 5. During a timed 30-minute pause in its program, the circuit monitors the battery's voltage drop when 'off -charge', as indicated by the fIashing green LED. This is to identify batteries unable to retain their charge adequately when taken off charge. Suspect batteries are identifi ed by the red LED indicator. The circuit will continue to provide the battery 'fl oat charge' support until disconnected. 6. Batteries which pass the voltage retention test are signalled "good" by the green LED and are then provided charge current according to their need lor 30 minutes in each hour thereafter so as to support connected electronic alarms or other small loads. The voltage retention check (step 5) is repeated during each alternative hall-hour thereafter lor as long as Optimate 3+ and battery remain connected.